Sometimes you just don’t want to take the time to wash your face, which is why I love micellar water because it is so handy and easy to use. I have been using various brands of micellar water for quite a while now. 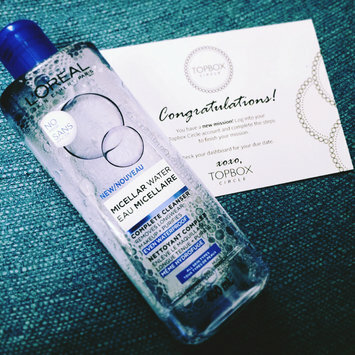 I received this L’Oreal Micellar Water Complete Cleanser complimentary from TopBoxCircle for testing and review purposes. This product did a great job at removing my makeup at the end of the work day, and I found that my makeup came off very easily with a simple wipe of a cotton pad. Even my long-lasting mascara was able to be removed without any need to harshly scrub my face. I also like to use my micellar water as an all-over toner in the mornings to draw out any of the impurities in my skin that may have accumulated overnight before I start my makeup routine. However, I found this brand to be quite oily and did not absorb into my skin as quickly as I would have liked, leaving me with the feeling that I needed to rinse it off of my face before applying my makeup. For this reason, I would recommend only using this product at night when you have the time to let it fully absorb into the skin. Also, if you tend to have oily skin this version of micellar cleanser water may not be for you. I found this micellar water to be very gentle on my sensitive skin and did leave my skin feeling soft. I received a deluxe sample size of this in my April TopBox. While I can't say that it gives my hair any extra body, it smells amazing and my hair definitely feels softer after using this product for a week. I usually apply it when my hair is damp and try to keep it away from my roots as I have very fine and oily hair. I put my original short Hunter rainboots to the test on this rainy spring day ☔️ I have both the tall and short version of these waterproof boots which are perfect for rainy conditions. I have also worn them during the colder months with a fleece lining insert to keep my feet warm. These boots are very stylish and go with any outfit. I like to pair mine with a yellow raincoat for a classic spring look 🧥 I definitely recommend these high quality rain boots. This is quickly becoming one of my favorite monthly beauty subscriptions! The range of products from skin care to makeup are amazing! I have been receiving this subscription for almost 7 months now and I have yet to get a product that I don't like. This box has introduced me to so many new brands based out of the UK and the wonderful part about this subscription is that if you get a deluxe sample of something in your box that you absolutely love, chances are they sell the full size on their website. Bonus - the UK website has free shipping making it super easy and financially feasible to purchase products in Canada ☺️ Highly recommend this subscription box! I really do like the consistency of this brow gel formula, but the medium brown that I purchased was definitely to light for me, and I can see from swatches of the dark brown that it will be too dark. There are only 4 colours to choose from which is a bit limited in my opinion. I thought the brush applicator would have more of a defined tip, but because it doesn’t I found that I didn’t have very much control during the application process. It does come with a spoolie which allowed me to comb through my brow and try to apply the product more evenly but I found the whole application process to be a bit messy. Also, because the spoolie is a loose applicator separate from the product I have found myself misplacing it and as a result just not even being bothered to use this product. My go-to brow gel has been the Benefit Cosmetics Gimme Brow+ Volumizing Eyebrow Gel and I just found that this Maybelline brow gel was extremely messy and difficult to apply compared to my Benefit Brow Gel. Unfortunately, this product was a complete miss for me, and I think I will stick to spending a bit more money to purchase my go-to brow product that is designed better and easier to work with. I have super fine and thin hair and find it hard to achieve any kind of volume with my flat hair, until I found this volumizing powder! I just sprinkle a small amount directly onto the roots of my hair and rub it in gently with my finger tips using an upward motion. This powder definitely works and gives my hair the desired lift and volume I’m looking for. 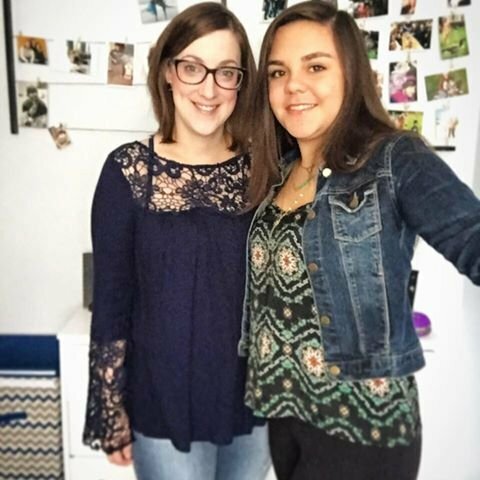 I find that it doesn’t last all day for me, but because it is small I am able to easily throw it in my purse for when I feel that I need some extra volume throughout the day. I forgot to put on mascara before heading to work today, so on my break I ran to the local drugstore and purchased this mascara to get me through the day. Luckily it only cost me $12 Canadian, because I threw it in the garbage at the end of the day. The mascara packaging claims to achieve a natural look, so natural in my opinion it was like I wasn’t even wearing mascara! I must have put on a half a dozen coats before it was even noticeable that I was wearing mascara. I like to spin my wand and move it back and forth during application to try and coat all of my lashes and this became troublesome with this mascara as the wand bristles are only long on one side and as a result I ended up with mascara on my water line and even poked my eye with the bristles. The formula is not very pigmented at all, hence the 6+ coats before I finally gave up applying. The 1 star I gave for this product review is because even after numerous coats, it did not leave any clumps at all. I have used other Marcelle products in the past that I have enjoyed very much, but I was very disappointed in this mascara.